Ootek specifications: Length: 17' 6" Width: 23-1/2" Weight: 35 lbs. Cockpit: 33"x16"
Follow my new video series "Building Ootek" on my Laughing Loon Facebook page! 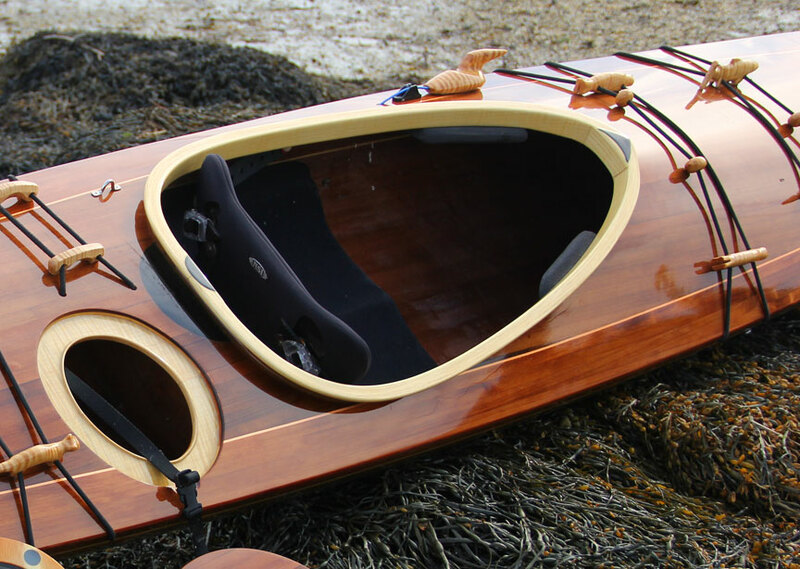 Ootek is a soft chine West Greenland inspired design, a meduim low volume kayak. Ootek tracks well, turns effortlessly and rolls easily. Fore hatch storage, stern and day hatch storage are all dry bulkheaded compartments with waterproof hatch covers sealed tightly with rare earth magnets. 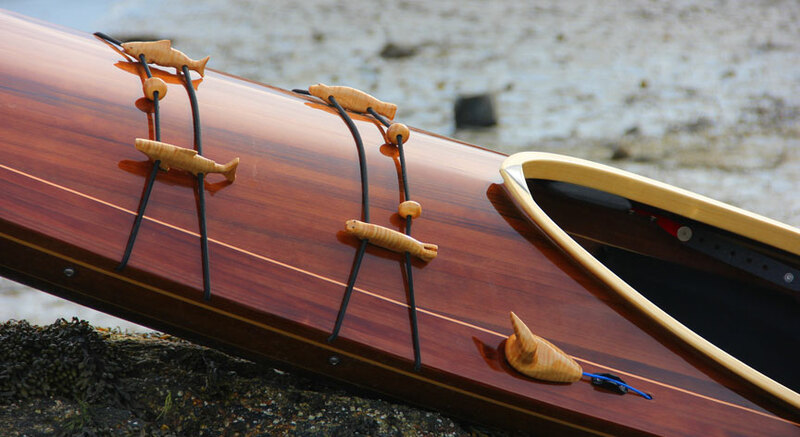 This Ootek is built of western red cedar with white pine hull stripes, an ash cockpit coaming, veneer accents and a copper tape pinstripe on the deck, delineating the different inner and outer strip patterns of western red cedar. Ootek has a classic low raking Greenland style bow with traditional ball end hand grips made of basswood with a bubinga locking pin. Ebony, ash and flame maple veneers add visual interest. Hatches are sealed with rare earth magnets pairs. 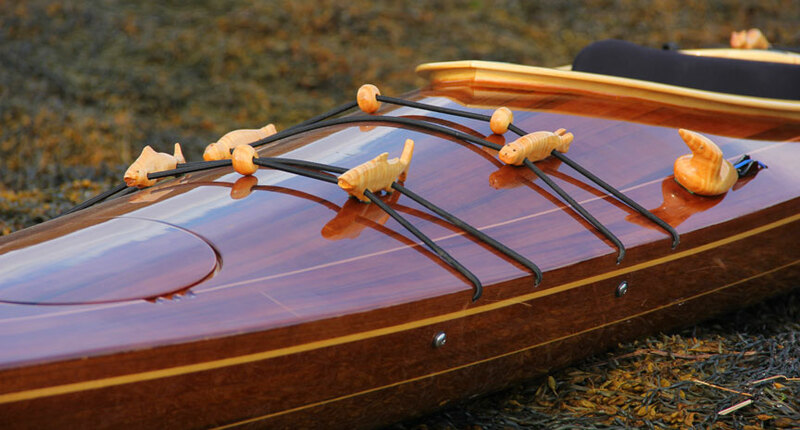 Magnets on the deck opening lips are hidden under flame maple veneers. The innermost edge of the deck lip has an added raised edge which cuts into the hatch cover gaskets insuring a watertight seal. Magnets are visible on one hatch cover above as is the groove cut into the hatch cover gasket by the raised innermost edge of the deck lip. The beautiful ash hardwood cockpit coaming has ebony accent veneers echoed by the scalloped ebony veneer behind the coaming rear lip. The carved closed cell foam seat is covered in black neoprene and the backrest is a very comfortable NSI fully adjustable anatomic design also in black neoprene. Closed cell foam thigh braces are fixed under the cockpit coaming edge near the front. 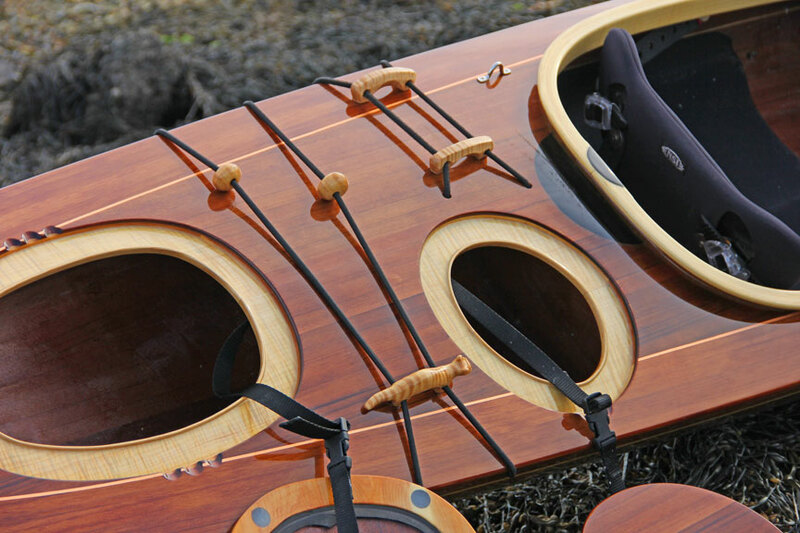 The Harmony Slidelock Footbrace System installed, makes foot brace adjustment easy even while sitting in the kayak. An adjustment bar extends into easy hand reach for quick placement changes. Traditional deck hardware effigies of flame maple add a little fun! The loon is a skeg control. Contact Laughing Loon for details. From Boards to Beach, right here! 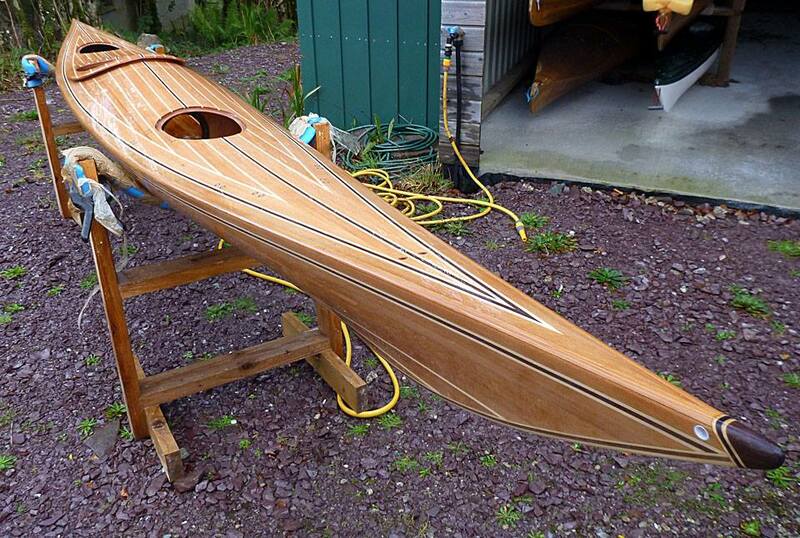 Etienne Muller of the village of Sneem, County Kerry, Ireland has finished another of my kayak designs, Ootek. 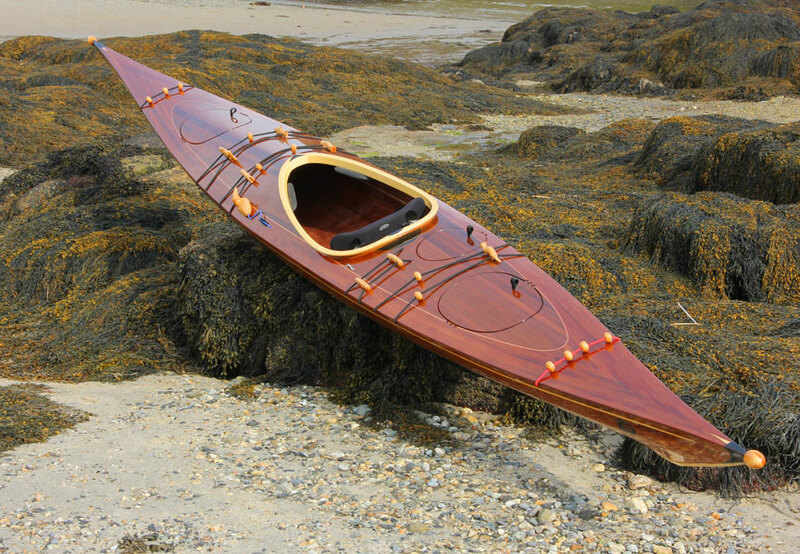 A gentleman of many talents, he has done an outstanding job building a beautiful kayak. I had my Ootek out yesterday in a bit of rough water. It is astoundingly stable. I would put anyone in it without concern of them getting nervous. Catches waves very nicely too. Also surprisingly dry for such a low profile, upwind and off the wind. It turns very easily, even flat, and definitely benefits from the skeg to stiffen it up when you want to stop fooling around and cover ground off wind. 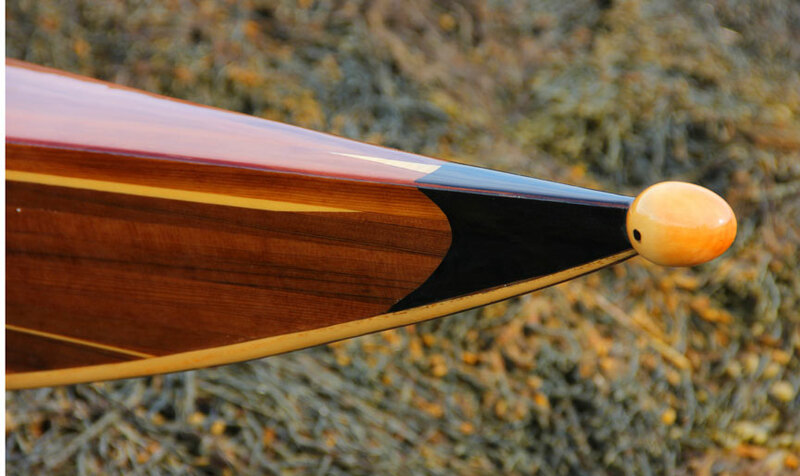 It is very sensitive to the skeg, the smallest difference in deployment has a noticeable effect, which is very nice for fine tuning direction over distance. The boat is also great in combo with a GP, allowing a very comfortable forearm angle with a low angle stroke. The only limitation is foot-room really. My UK 9.5 Euro 44 feet are as big as it will allow without altering the deck, and that is with a footpad, which is all I use these days anyway. Foot pegs at the sheer are not going to work with this boat. I am Six ft tall, if you are taller footroom will be more restricted, if you are shorter you will have more foot-room. Footroom restrictions however do not reflect in the comfort of the cockpit area in general. I have a fairly small cockpit in it (26 inches long) so my knees are under the deck, and general legroom is fine. I think this is going to be one of my grab and go boats for general hacking about. I am finding the Ootek is fun because it is so supportive and will let me fool around without paying the price, while still being low profile. A nice winter boat for me. My wife was out in it recently too, in rougher water than she would normall even look at, and was totally at ease. She has stolen the boat. I am 220 lbs, she is 150, and the boat is great for either of us. Very versatile really. I have also had it out on a 25km rough water circular route in tandem with an animal fifteen years younger than me paddling a Nordcap. This guy has circumnavigated ireland and eats hammers for breakfast. i was using a greenland paddle. I was working a little harder than he was for speed, but he was having to mind his balance, which was not an issue for me. So against unfair odds the Ootek acquitted itself rather well. We covered the distance in three and a half hours. So in regard to speed, I would think that she is not the fastest boat on the water, but quick enough. She certainly won't embarrass you in a group. In addition, from your perspective, it is a very easy boat to build in regard to its shape. It is also a very elegant looking boat, beautiful really. Caveats: it does really benefit from the skeg. First time builders can be in a hurry to finish and leave out the skeg. Take the time to install one. Some of the boats in my rack are great fun, but they are not for everyone. I have no hesitation in recommending the Ootek as an extremely sea kindly, user friendly boat for anyone, provided you don't have clown feet.